Tea is a tradition and not just a drink. A cup of tea fits well in every situation; be it a family gathering, stressful day at the office or just the beautiful start of your day. Tea is the ultimate reach. 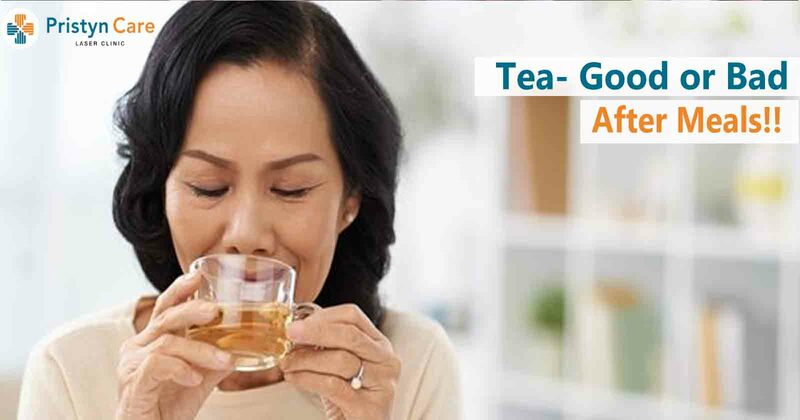 Tea has become a new addiction and is common among young, middle-aged and elderly people. Some people like to have their cup of this steaming delight after their meals. But, is it good for your health? There is a lot of suspicion on this topic. Let’s find out if tea is “Good” or “Bad” after meals. Green tea and other herbal teas accelerate the process of digestion by stimulating digestive enzymes. The polyphenol content in green tea speed up the breakdown of proteins by increasing the activity of pepsin. It prevents gastric problems and constipation. Facilitates absorption of nutrients from dietary fiber. These teas contain a compound called tannin. Tannin slows down the absorption of minerals such as calcium, iron & zinc leading to deficiency. It may also trigger constipation. Hence, if you already have problems with constipation, avoid tea after your meals. As you may be familiar, tea contains caffeine. But do you know the major side-effects of caffeine? Caffeine can lead to poor sleep, provoke existing ulcer and can also cause instability in blood pressure. Considering all the points together, it is good to avoid regular tea after your meals. And, if you like, you can try a cup of green or herbal tea after your meals for a better digestion.